Bucking industry trends, Kitsap Bank steers toward decisions that assure it will be around for its customers many years from now. 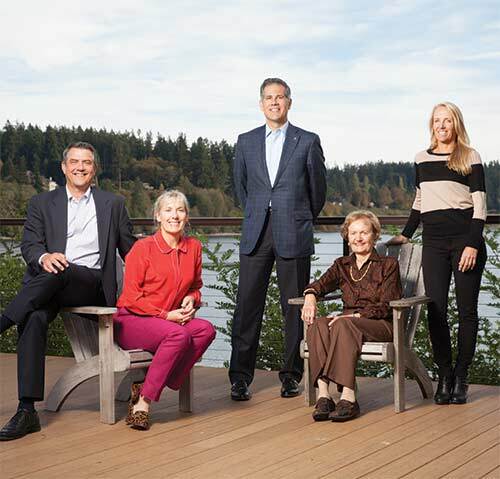 With three generations of the Frank E. Langer family in leadership for more than 90 years, the bank sets a tone for ongoing community relationships, says CEO Steve Politakis. Founded in 1908, Kitsap Bank is a full-service community bank with 260 employees serving Kitsap, King, Pierce, Mason, Jefferson and Clallam counties. Three Langer descendants serve on the bank’s board as chair (Cydly Langer Smith), vice chair (Helen Langer Smith) and director (Melinda Smith Pigors). With the recent acquisition of Fife Commercial Bank, Kitsap Bank will soon boast 21 branches. Another milestone came with the second-quarter announcement of assets totaling more than $1 billion. McLendon Hardware has found some power tools for growth in the past three years. The company is known for creating a neighborhood atmosphere, such as serving up annual community breakfasts. In 2012, its seventh store opened in Tacoma, bringing overall employment to more than 500. Revenue grew 18 percent the past three years, from $72 million to $86 million. Founded in 1926, the company has 40 family shareholders. A senior executive team regularly meets to map strategic goals, as does the board of directors. A family council gathers monthly. The company also is a big supporter of community programs. Founded as builders brick company in 1900 after the great seattle fire of 1889, Mutual Materials literally helped rebuild the city. Today, its products grace countless public structures, commercial buildings, homes and landscapes with materials ranging from brick and concrete masonry to natural and cultured stone supplies. Owned and operated by the Houlahan family for five generations, Mutual Materials has built a strong reputation with a customer base comprising architects, homebuilders, contractors and homeowners. The company has 440 employees and operates 10 manufacturing facilities in Washington, Oregon and British Columbia, plus 16 distribution centers throughout the Northwest. Six family members are shareholders and they remain current through annual shareholder meetings and twice-yearly board of directors meetings.